A rising lyric tenor Evgeny Akhmedov studied voice at St. Petersburg State Conservatory with soprano Olga Kondina and had taken master classes with tenor Neil Shicoff. From 2011 he has been a soloist with the Mikhailovsky Theater in St. Petersburg, and has already performed Gastone in La Traviata, Lensky and Triquet in Eugene Onegin, Spoletta in Tosca, The Gamekeeper in Rusalka, Almeric in Iolanta, Judas in Slonimsky’s Master and Margarita, Master of Ceremonies and Chaplitsky in The Queen of Spades. 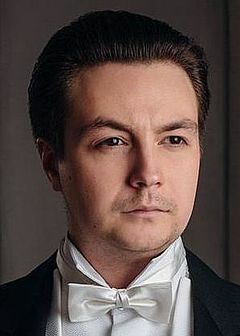 In the 2012/13 season, Evgeny Akhmedov sang Lensky in Eugene Onegin (Andriy Zholdak, director, Mikhail Tatarnikov, conductor), A Novice in Billy Budd (Willy Decker, director, with Neil Shicoff as Captain Vere), Don Ottavio in Don Giovanni (in concert), Edmondo in Manon Lescaut (in concert, with Vladimir Galuzin as Chevalier des Grieux), and Beppe in Pagliacci (Liliana Cavani, director). Recent and upcoming engagements include Daland’s Steersman in The Flying Dutchman (Vasily Petrenko, conductor, Vasily Barkhatov, director), Lensky in Eugene Onegin (Savonlinna Festival), Beppe in Pagliacci and Nemorino in L’elisir d’amore (Mikhailovsky Theater).